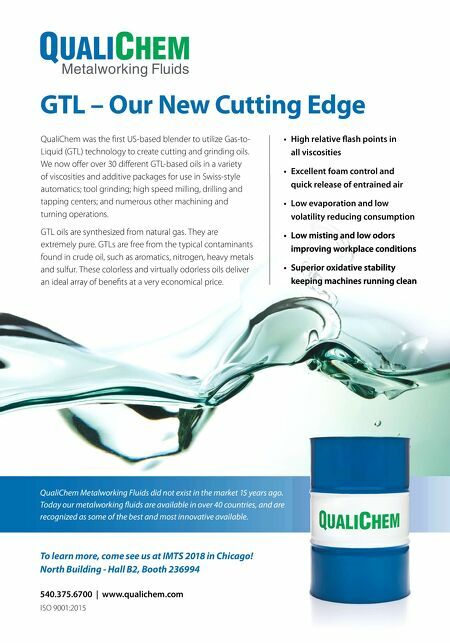 QualiChem was the fi rst US-based blender to utilize Gas-to- Liquid (GTL) technology to create cutting and grinding oils. We now off er over 30 diff erent GTL-based oils in a variety of viscosities and additive packages for use in Swiss-style automatics; tool grinding; high speed milling, drilling and tapping centers; and numerous other machining and turning operations. GTL oils are synthesized from natural gas. They are extremely pure. GTLs are free from the typical contaminants found in crude oil, such as aromatics, nitrogen, heavy metals and sulfur. These colorless and virtually odorless oils deliver an ideal array of benefi ts at a very economical price. 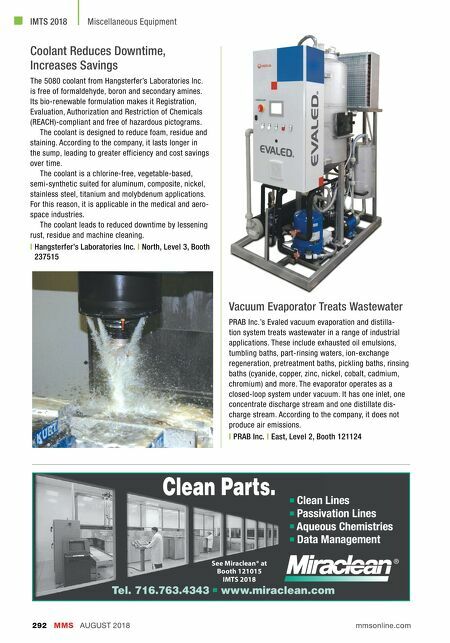 • High relative fl ash points in all viscosities • Excellent foam control and quick release of entrained air • Low evaporation and low volatility reducing consumption • Low misting and low odors improving workplace conditions • Superior oxidative stability keeping machines running clean GTL – Our New Cutting Edge 540.375.6700 | www.qualichem.com ISO 9001:2015 To learn more, come see us at IMTS 2018 in Chicago! North Building - Hall B2, Booth 236994 QualiChem Metalworking Fluids did not exist in the market 15 years ago. Today our metalworking fl uids are available in over 40 countries, and are recognized as some of the best and most innovative available.